LSBU’s International Study Abroad programme brings students together from all over the world. By studying at LSBU, students become part of an integrated Study Abroad community on an incredibly diverse campus. As an International Study Abroad student you will be able to choose modules from across the University. In addition to the three modules chosen, all Study Abroad students take our Study Abroad specific module: ‘London: City of Change’. This module allows students to learn about the lifestyle, culture and history of London with specialist teaching. Within this module, there is the opportunity to take tailored trips exclusive to international Study Abroad students to places such as The Royal Museums Greenwich and Shakespeare’s Globe. Please see our key dates (PDF File 502 KB) which have been tailored to accommodate your studies both home and abroad. LSBU are proud to offer credit-earning internships to all international Study Abroad students in a variety of businesses and institutions. After a successful interview, you will be placed in a role that best serves your individual needs, interests, ability, and academic background within commuting distance. You will have the chance to become a professional member of the team that you are working in, which means you will need to attend your placement each week during your stay. To learn about the internship application process, please visit the MyLSBU Study Abroad pages. To complete an internship at LSBU you will have to obtain a Tier 4 visa. For more information about visa application see our visas page. 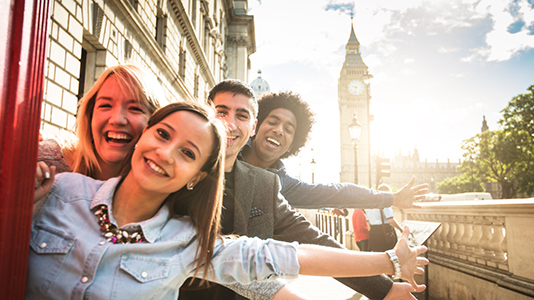 Study Abroad at LSBU costs less than many other London-based programmes, and includes academic experience, student support, and central London accommodation. Fees for 2019/20 academic year are set at £5,785 per semester. Accommodation costs are £3,500 per semester. For information on finding help to fund your studies, please visit our list of international scholarships. You can find out more about international fees on our dedicated page. Complete your application form online. When you are submitting your application, confirm that the course you are applying for is ‘Study Abroad’. *Internship options: If you wish to apply for an internship as part of your semester abroad, please note that the deadlines are 1 month earlier (1 June for Autumn Semester, 18 October for Spring Semester). You must be enrolled at an accredited university on an undergraduate degree programme. To complete the Study Abroad programme at LSBU, US Students must hold a GPA of 2.75 (on a 4 point scale). If you are not studying at a US university you must meet the entry criteria stated in the ‘Your country’ section. The entry requirements listed on these pages are guidelines, and applications will be assessed on a case-by-case basis. Proof of English language proficiency is also necessary for acceptance into the University. For more information about the University’s policies regarding proof of English language please see our entry requirements. For all enquiries about Study Abroad, please email studyabroad@lsbu.ac.uk.